We found 10 episodes of Renaissance Life Show with the tag “renaissance life”. Welcome to the Renaissance Life Show! Session #13. Today's episode is a conversation with multi-disciplinary Joseph Shipp. He's done work for some top name brands including Atlassian, Nike, and IDEO. A Year of Saying Yes, Mental Health, Improv and more with Ludine Pierre. Episode 11 of the Renaissance Life podcast. A conversation about creativity, health and wellness, improv, religion and finding your passion in life. "If you do something every day, you're going to get better at what you are doing." "You have one very vapor-esque life on this earth, you're here for a very short time — it's like a blink — what are you waiting on?" Two Josh's sit down and have a jolly good time discussing music, philosophy, pain, health and wellness, daily challenges and more. If you like fun, you'll love this episode. Stratton and I have a fun conversation about all manner of things including his career in music so far, travel stories and pursuing creative work. Gabriella and I discuss our goals, what it means to have compatible goals with ourselves and one anther. RL006: Renaissance Dating Hello Gabriella. Who is Gabriella and how did we meet? For Entrepreneurs and Creatives alike. 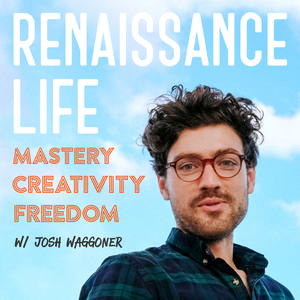 answers, business, life mastery, life mastery empire, lifestyle design, mastery, mission, passion, purpose, questions, renaissance, renaissance life, renaissance man, renaissance podcast, renaissance woman, what is your purpose? RL#004: Q: What is Your Mission in Life? A new type of episode on the renaissance life podcast about asking questions, finding answers to help spotlight your best self, and clarify your purpose.